On this day in 1918 James Alexander Kitchen, a printer, signed up in Detroit, Michigan. Kitchen was born in Deseronto on June 25th, 1898, the son of Sidney J. Kitchen and Annie (née Breault). eldest son of Mr. and Mrs. Sidney J. 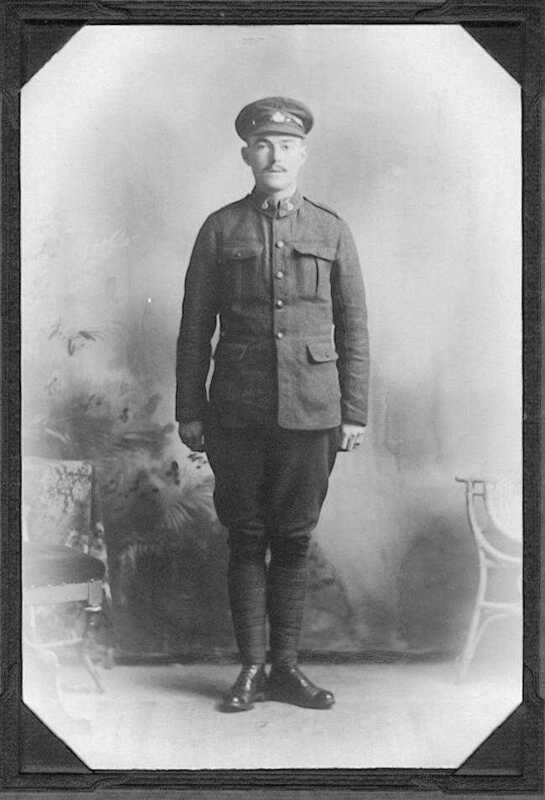 Kitchen, Deseronto, who is now with the 1st Depot Battalion, 1st C.O.R, Pte. Kitchen is well known in Deseronto and surrounding districts and was at one time an employee of The Deseronto Post before going to Detroit, Mich,. from where he enlisted last 25th of May, training till lately at Niagara Camp. Kitchen’s service record shows that he arrived in England on the SS Corsican on August 8th, 1918. After training, he was transferred to France on November 6th, 1918. He was back in England in January 1919 and left England for Canada on the SS Empress of Britain in February, arriving on February 25th. He was demobilized on March 17th in Kingston. James married Detroit native Marie Matilda Brandenburg in Deseronto on June 25th, 1919 (his birthday). In 1921 the couple were living in Dundas Street, Trenton, and James was working as a brakeman on the railway. James’s nephew, John, tells us that he died on August 10th, 1972 in Belleville.